Welcome to the most comprehensive buyer’s guide of portable hot tubs and spas that you can buy online for less than 500 Dollars. Gone are the days that hot tubs were for the rich and famous, or that you needed a dedicated area in your garden to keep one all year round – portable hot tubs now give you the chance to sit out and relax, then pack it away when you don’t need it… all at a great affordable price, often a fraction of the cost of a permanent installation. 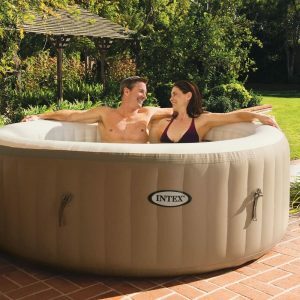 In this guide we have researched the best portable hot tubs and spas and have read through hundreds of actual user testimonials to offer you a complete and unbiased guide based on actual facts, reviews and experiences from people who have already bought the products and who have described their pros and cons online. Make sure to read till the end of this article because we provide valuable tips and answers to several questions that many people have about Hot Tubs and also tips for maintaining your tub to help you make the most of your purchase. What are portable hot tubs? Can I leave the water in the tub? Next we will take a look at the best 4 portable and affordable hot tubs that you can buy online and have a price tag under $500. First, let’s quickly see the top 4 list based on our extensive research. After that, we provide more details about each product to help you make an informed decision. This is our top recommendation and you can verify this from the reviews of the product on Amazon. At a price point below $400, this is the best value for money hot tub you can buy nowadays. Although it’s priced at a very affordable cost, its durability is remarkable. The walls are made using I-Beam construction allowing users to sit on the sides without any fear of bending or damaging the spa. With polyester mesh core encased in two layers of PVC and TriTech 3 ply reinforced material, the Coleman hot tub is superior to others in its class. The digital controls of the spa allow four modes of operation: (1) Circulating pump ON with heater ON (2) Circulating pump ON with heater OFF (3) Air pump ON (producing bubbles) (4) everything OFF. Its temperature is adjustable, reaching a maximum of 104 F (takes an average of 24hours to fully heat the tub from 40 to 104F). An inflatable cover provides excellent insulation to keep the water warm when not in use. Heater and Pump are very quiet. Fairly easy and straightforward setup. The floor is cushioned enough that it is very comfortable. Very thick and strong material. Plenty of energetic bubbles making you feel very relaxed in the tub. Bubbles cool the water off because the air pump draws cold air from the outside and blows it out the little holes in the bottom of the tub. Estimated of 4 degrees heat loss every 15 minutes. So if you have the temp at 104F and turn on the air-bubbles, it will lower the water temperature to 100F within 15 minutes. This of course is the same with all portable tubs with air jet bubbles. For safety reasons, the heater and pump switch off after 72 hours so you need to reset the settings if you want to use it later in the afternoon for example. Some people complained that there was leakage from the inflatable vessel of the tub but the company (sold by Amazon) quickly sent them a replacement product. 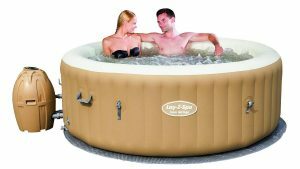 The Bestway Lay-Z-Spa Miami tub has made it to the second place of our list. This is a very good product, comparable with the Coleman, offering an affordable and durable tub. 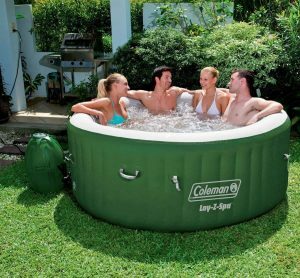 Similar to the Coleman, this hot tub uses 3-ply reinforced material consisting of a polyester mesh core, encased in two layers of laminated PVC (TriTech). Together with the spa you will receive also an inflatable cover (insulation to keep the water warm), chemical floater, filter cartridge and DVD with instructions. This tub can be used both indoors and outdoors (just like the others of course), offering you relaxing moments with your loved ones. Its 120 bubble jets are ideal for soaking your sore muscles in the hot water thus releasing your stress after a long day. The hot tub works well even in low temperatures (40 degrees). The pump produces enough air bubbles to be enjoyable. Pretty big with plenty of room. For safety reasons, the heater and pump switch off after 3 days so you need to reset the settings if you want to use it later in the afternoon for example. Some people complained that the pump started making growling noises but the company (sold by Amazon) quickly sent them a replacement product. This is from the same company as the previous model but with a larger size and water capacity. It can fit 4 to 6 persons comfortably and with its premium leather look, mellow color palette and leather texture reflects its high-end spec and luxurious extra features. Since it holds more water capacity than the other tubs (254 Gallons), be careful where to place this tub because its quiet heavy. If you place it on a wooden deck, make sure it supports the weight. 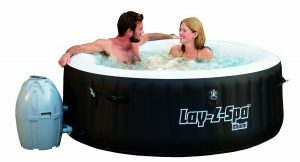 Regarding its features and built quality, these are the same as the Bestway Lay-Z-Spa Miami we’ve mentioned before. Also, the pros and cons of this tub reported by customers are more or less the same as the previous tubs. The price of this hot tub is a little bit higher (only $10-$15) from the “Miami” model, so in my opinion if you want to accommodate more persons in the tub, I would suggest to buy this one instead of the “Miami” model. However, have in mind that the largest water capacity will need more electricity consumption to keep warm. This is another great choice of hot tub with durable construction. Its fiber-tech construction offers superior structural stability while maintaining comfort for users while sitting in the tub. Another great feature of this spa/tub is its hard water treatment system which ensures that water is gentle on the skin all the time. By activating the 120 high-powered bubble jets surrounding the interior of the spa, you will experience a refreshing massage after a long day at work. Works very similar with professional hot tubs. Hard-water treatment system is good for skin. People complain that this is made in China product. Some people complained that the pump or heater died after a few months (however, they got replacements from the vendor). Portable hot tub spas are inflatable pools that contain a built-in pump, a couple of filters, a water heater, and hydrotherapy pressure jets. All you need to do is plug it into the mains, fill it with water, and let the heater do its job. Once it’s up to temperature, turn on the jets and jump in! Once you’re done with the tub, and want to pack it away for the winter, simply release the water deflate the tub and put it back in its box to be stored. Depending on the brand of tub that you buy, a small inflatable hot tub could take anywhere up to half an hour to pump up. Luckily the pump is usually built-in, so you won’t be building up your thighs with a manual foot pump! Once you’ve filled the tub with water, you’ll need to heat it – it’s not much fun sitting in a cold tub! Most portable hot tubs come with an integral heater controller, so setting the desired temperature is just a matter of pressing a few buttons. Because of the volume of water the tub holds, (on average a 2-4 person portable hot tub holds around 230gallons), the heater could take some time to get up to temperature – again, this will depend on the model of tub you buy. Usually, it takes around 24hours to heat the water from 40 to 104 F.
Now the tub is up to temperature, it’s time to turn on the pump… the water will circulate in through a filter and back out through the jet. You’ve now got your very own portable inflatable spa! Yep, in fact many people find it more efficient to leave the water in the tub, and keep it up to temperature using a timer… this could prove cheaper in the long run then heating the tub from cold each time. If you’re going to reuse the water you’ll need to treat it with the necessary cleaning chemicals to keep it clean – follow the instructions from your hot tub manufacturer carefully here, you must use the chemicals in the right way. You’ll also need to clean the filter regularly, to stop the pump from blocking up and running dry. Some people like to have a spare filter on standby, so you always have a clean one to fit. A good idea would be to use a custom cover to stop leaves and other debris from getting into the pump. However, the tubs we described in our reviews above include an inflatable insulating cover to protect the water from debris and also to keep it warm. Provided you follow the manufacturer’s instructions with regards to the electrical power requirements, and how to treat the water in your tub with the right type of spa chemicals, you shouldn’t have any problems with the tub at all. The instructions should also tell you where you can buy the right supplies and accessories for that particular manufacturer’s brand of hot tubs. It’s worth remembering that the tub, when filled, will be very heavy – an average 230gallon tub weighs almost a metric tone – so before you fill it, give a bit of thought as to where you’re going to put it. A solid, level area of ground is ideal. And finally, as the portable hot tub will be a few feet deep when filled, you should always supervise children when they’re using it.